One of Hirosaki Castle Park's many beautiful locations is the castle moat. Here, visitors can rent boats and go for a ride surrounded by hundreds of beautiful cherry blossoms. Lights come up for the evening around Ueno Station as a Keihin Tohoku line train pulls in. Matsumoto Castle reflections in the water on a Spring morning in Nagano, Japan. The colors of dusk light the sky over the historical Bikan District in Kurashiki, Okayama Prefecture, Japan. 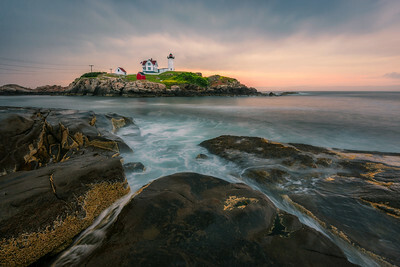 The colors of "magic hour" live up to their name at the Nubble Lighthouse in York, Maine.